Michael McFadyen's Scuba Diving - No Frills Hopper Barge This wreck is one of the many vessels sunk at the Long Reef wreck site off northern Sydney. It is a very large and strange looking hopper barge. I have yet to discover the history of this vessel. It was sunk in December 1979 and is located at GPS reading 34º 08' 21" S and 151º 09' 02" E. Note that all the GPS Readings on my Web Site are taken using AUS66 as the map datum. 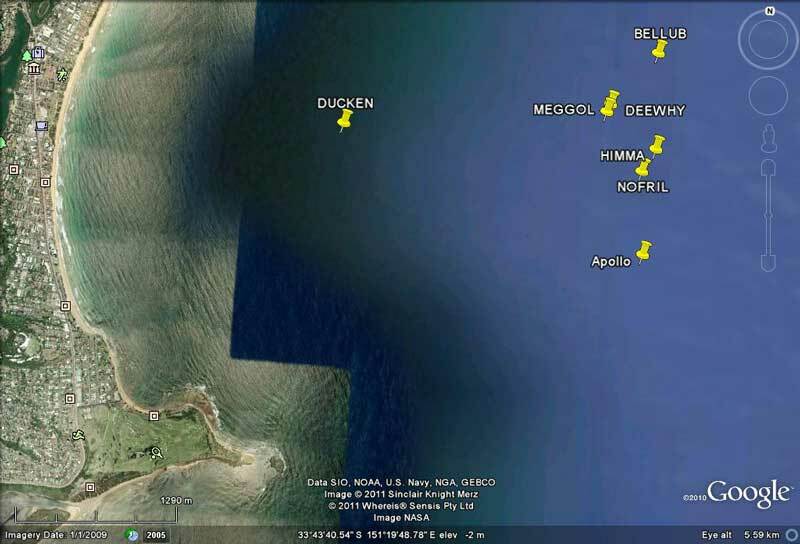 If you use another datum you may be about 220 metres off the wreck. See my GPS Page for more details and how to convert readings. You need to run east-west to cross the wreck. Best anchor is in westerly winds when you need to anchor on the western side. Anchoring on the top is unlikely to achieve a result. The name comes from the No Frills Dive Club which may have rediscovered it but Tom Byron's book (see references) lists this vessel. The wreck appears to lay north-south and sits on a sandy bottom of 50 metres. The top of the barge comes up to about 43 metres. The barge itself appears to be a very narrow and deep barge. It is about 61 metres long and 8 or so metres wide. It is perhaps 15 or so metres deep. The barge is lying on its side, so the width is the height of the wreck off the sand and the depth is the width of the wreck. The top of the wreck is a flat and slightly sloping surface, almost devoid of growth except for a covering of algae (?). Hence there is little for an anchor to catch on to. The top is on the western side and at either end there are some shallow holds. In the middle there is a deeper and larger hold. This also has a large rust hole over it. You can safely enter and swim through the hold area. The bottom of the barge (the eastern side) is quite strange to look at. It appears to be designed to sit low in the water with water able to enter the hull through the ends. You can also enter this area although extreme care needs to be taken as there are many cross-members and bits of metal to get caught up on. It is also very dark inside and could easily be stirred up to give nil visibility. A different dive, but only worth doing a few times but only by experienced deep divers.